My last Sunday at Moca Cafe couldn't have been better. 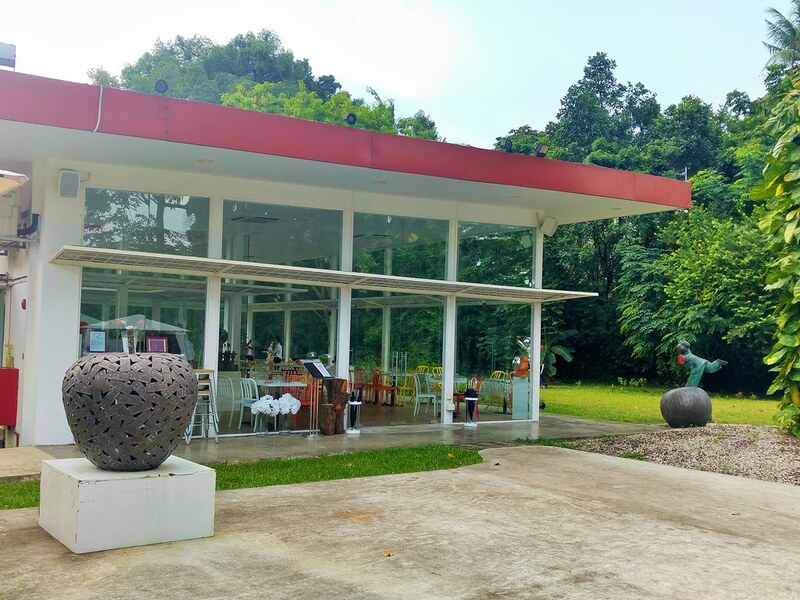 A standalone glasshouse nestled amid the lush greenery at Loewen Road at Dempsey, one could easily give this place a miss. 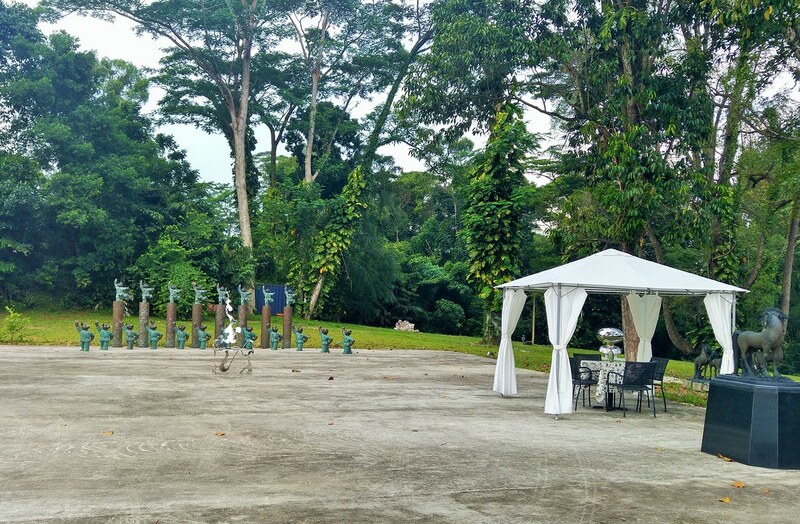 What caught my eyes first was the sculptures adorning the alfresco area. See the Little Red Book? These are actually the iconic Jiang Shuo's "Red Guard' sculptures. Though it is an extended arm of the Museum of Contemporary Arts (MoCA), I didn't expect to see art pieces in this premises as well. 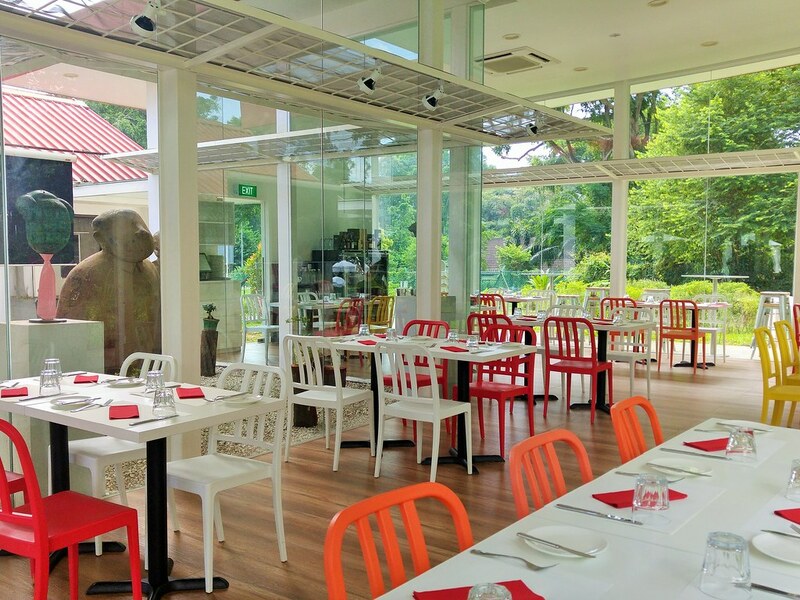 With simple furnishings and the greenery in full view, being inside the restaurant was just as tranquil. There were also a few other 'Red Guards' to accompany the diners. While waiting for our starters, the staff introduced to us the collection of herbs in their garden, which are all grown by Chef Nelson - Thai basil, chilli, tomatoes, limes etc. 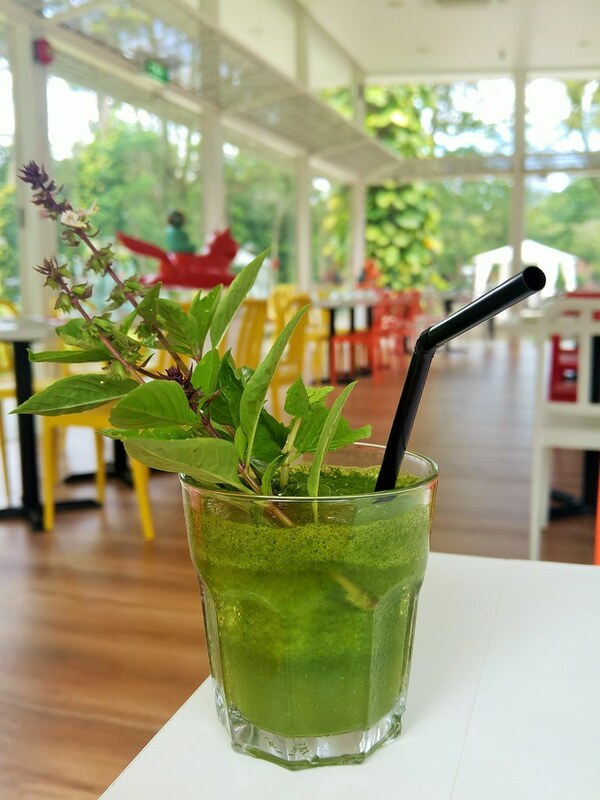 And they proudly presented to us their Thai Basil Mint Juice, with herbs freshly pluck from their own garden. That beats any fancy cold-pressed juices out there in the market. We had 2 wonderful starters - Burrata with Parma Ham and White Asparagus with butter cheese sauce. 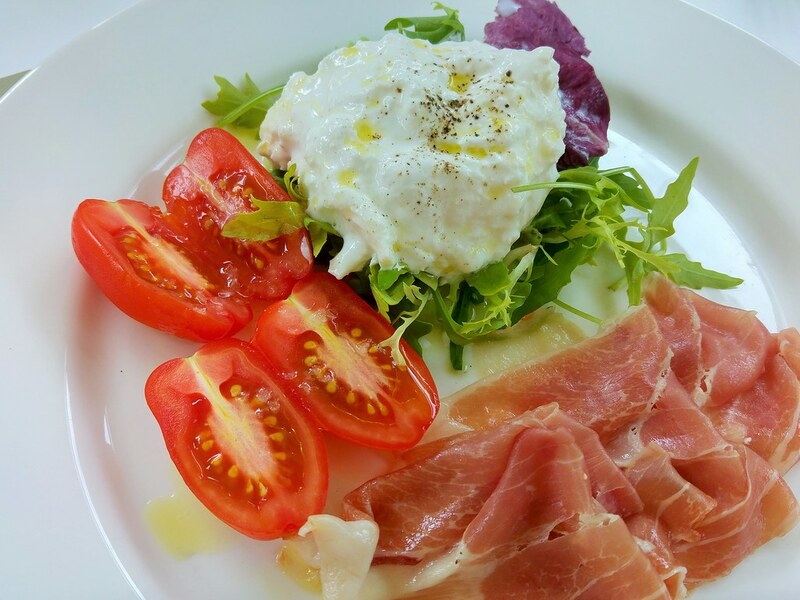 The Parma Ham was 18-months old and beautifully marbled with fats, lending a great deal of flavour to the dish without masking that of the pillowy burrata. The Italian tomatoes, on the other hand, supported the ingredients with its crunchiness and sweetness. 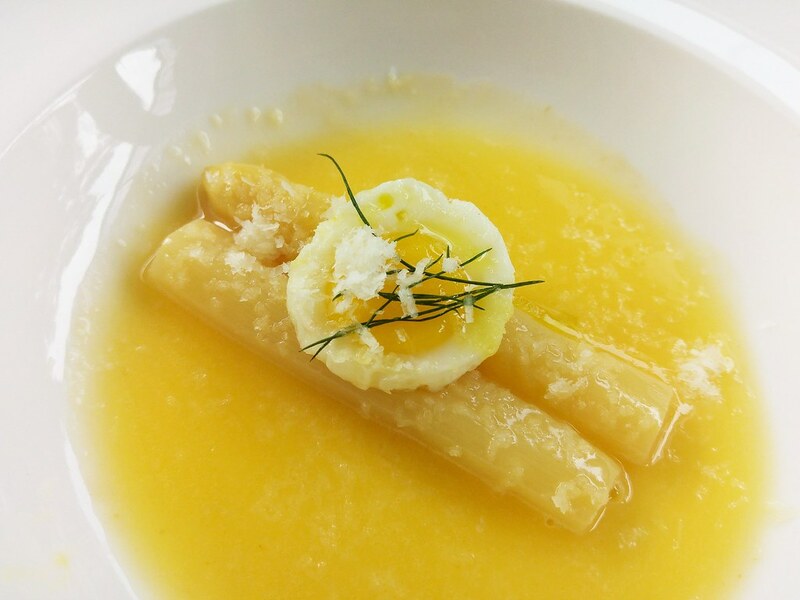 We were lucky to visit Moca Café this month, to be able to try this spring delicacy - White Asparagus, an ingredient well-loved by chefs and not easily available off the shelf. 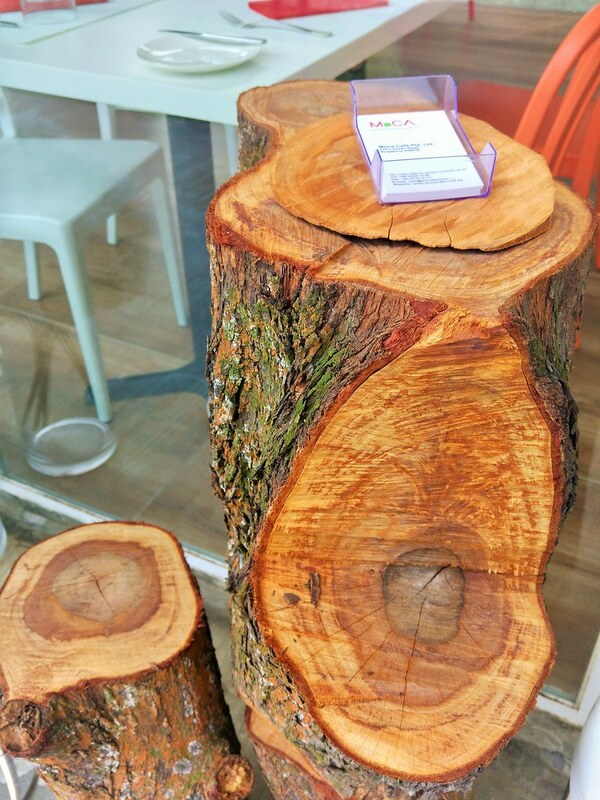 Grown without sunlight, which explains the colour. Perhaps it is the idea of eating a white vs the green one, I thought its flavour is more intense, along with a finer texture that had fully absorbed the sweet-savoury from the buttery cheese bath. Another seasonal dish is their Chanterelle Pasta. 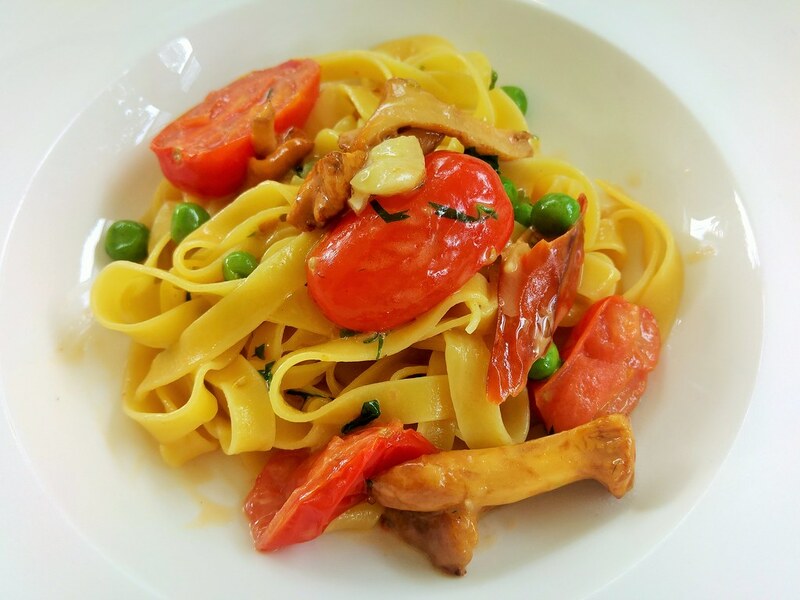 The pasta was only lightly coated with sauce, taking flavours from the ingredients around it - the sweet juicy tomatoes, crunchy sweet green peas, and the firm and earthy Chanterelle. Not to forget the punch from the slice chilli, sundried from Chef Nelson's garden. The pasta, however, could be done more al dente and portion scaled down to balance the ingredients. Like us, you may want to take your time to roam around the place and admire the art pieces before starting on your next course. Simply made that known to the staff, who are more than happy to pace your meal for you. What's unique to Moca's menu is their Asian dishes, prepared using premium ingredients such as waygu beef. Their Wagyu Oxtail Soup ($26) is highly recommended to each and every customer who walks into here. 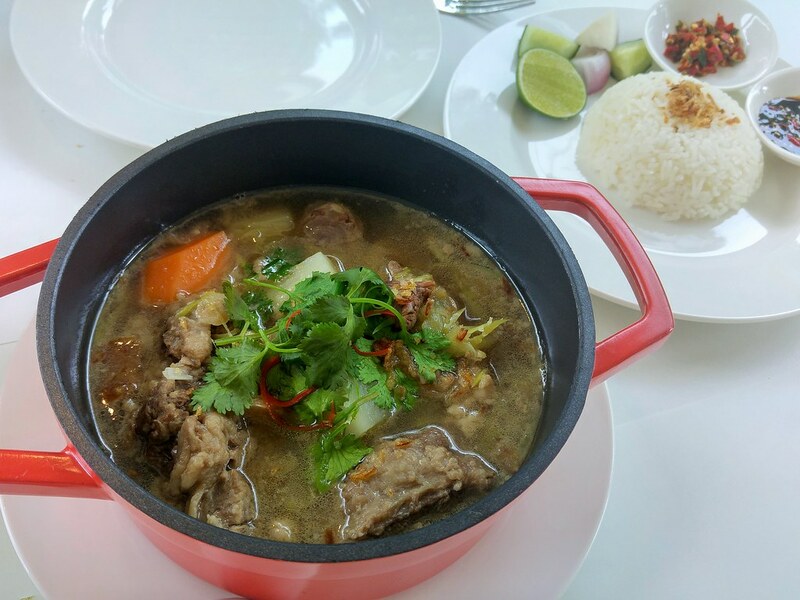 Not your regular oxtail in red wine reduction sauce, it is done in Indonesian style. With potatoes, carrots, celery, the soup is like a Asian style potato soup, made hearty with generous portion of chunky oxtail. A squeeze of lime lifted the flavour. With such big chunks of oxtail, I was surprised by the tenderness of the meat, akin to braised beef cheeks. There was almost no hint of beefiness. The dark soy sauce with chilli padi and homemade pounded chilli at the side round off the dish with a kick. You may eventually request for more rice! Another recommended dish is Cartoccio, with a choice of seabass or black cod. Cod was my preference, though they advised that seabass seemed to work better, judging from customers' feedback. 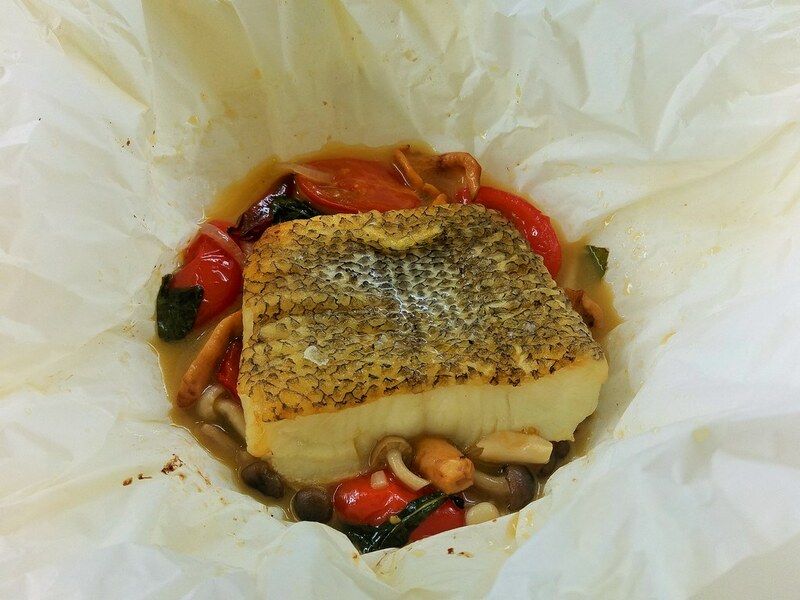 Perhaps, paper-baking is really not the best way to treat a cod fish. It sort of takes away the buttery texture of the meat, and my favourite crispy skin and sides are not there either. Nonethless, I appreciate the nourishing broth, which contained all the goodness and flavour of the ingredients. This is definitely something that I could have everyday. 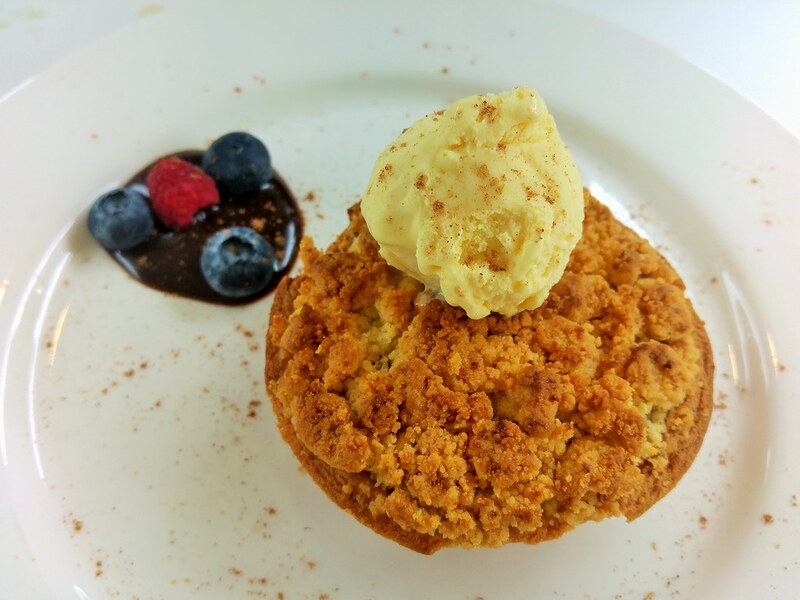 As it took a while to prepare their homemade apple crumble, Chef Nelson took the effort to entertain us with his stories, explaining to us the beauty of Moca Café, and sharing with us his experiences, his values as a chef. 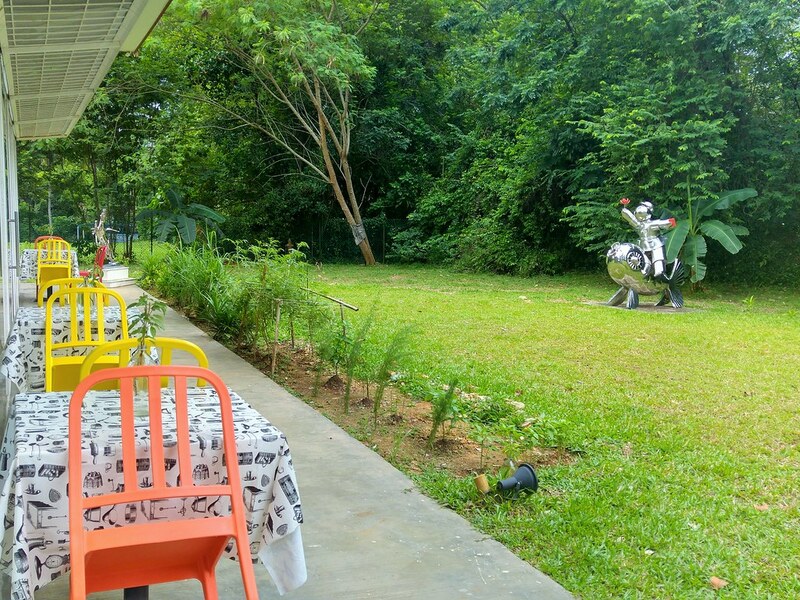 With all the hospitality given, I felt like we were dining at his own backyard. I love Apple Crumble, and theirs tasted just as sweet and comforting as its cinnamon smell which perfumed the air. Sweetness level was just right, with apple slices, raisins and walnuts wrapped in buttery crust. A bigger scope of ice cream would have been perfect. Before we left, Chef Nelson gave us a short tour around his garden. There are even papaya and banana trees! It was amazing how I could spend almost 3 hours here. 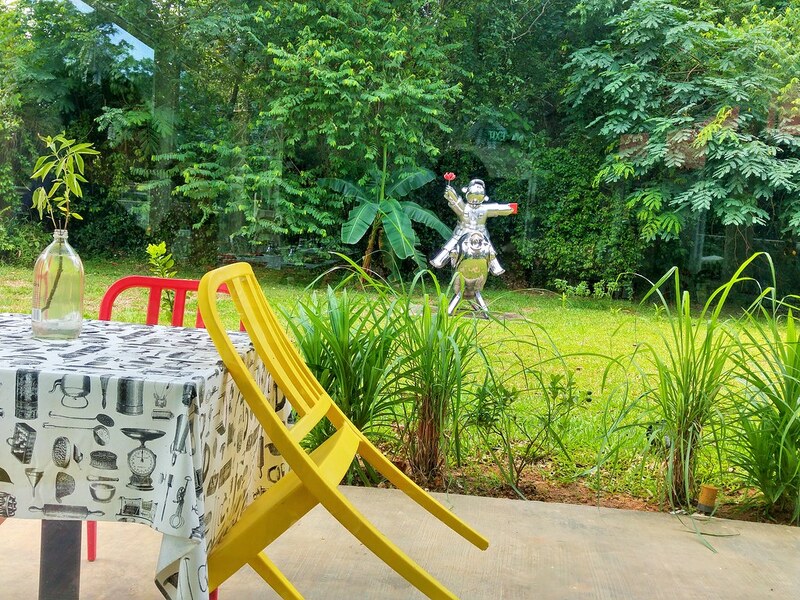 There is no fancy or hipster notion attached to it, like the hype around farm-to-table, neither is it a restaurant elegantly tucked within our city museums, but on days when the streets are packed with people and polluted with noises, being here at Moca Café is a huge respite. We walked over to the charming museum right next door, to look at more of the contemporary arts pieces being curated here. That completed my Sunday.